Vanderbilt, Carnegie, Rockefeller, Ford, Drew, Fisk, Harriman, Du Pont, Morgan, Mellon, Insull, Gould, Frick, Schwab, Swift, Guggenheim, Hearst- these are only a few of the foundation giants that have changed the face of America. They gave living reality to that great golden legend-The American Dream. Most were self-made in the Horatio Alger tradition. Those whose beginnings were blessed with wealth parlayed their inheritances many times through the same methods as their rags-to-riches compatriots: shrewdness, ruthlessness, determination, or a combination of all three. 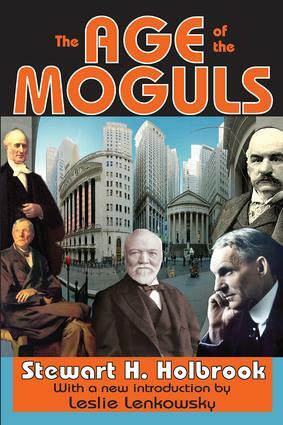 The Age of the Moguls is not overly concerned with the comparative business ethics of these men of money. The best of them made "deals," purchased immunity, and did other things which in 1860, 1880, or even 1900, were considered no more than "smart" by their fellow Americans, but which today would give pause to the most conscientiously dishonest promoter. Holbrook does not pass judgments on matters that have baffled moralists, economists, and historians. He is less concerned with how these men achieved their fortune as much as how they disbursed the funds. Stewart Holbrook has written a brilliant and wholly captivating study of the days when America's great fortunes were built; when futures were unlimited; when tycoons trampled across the land. Few writers today could range backwards and forwards in American history through the last century and a half, and could take their readers to a dozen different sections of the country, or combine the lives of over fifty famous men in such a way as to produce a continuous and exciting narrative of sponsored growth. Leslie Lenkowsky's new introduction adds dimension to this classic study.